Originally published under the title "European Union Caving to Turkey's Blackmail?" 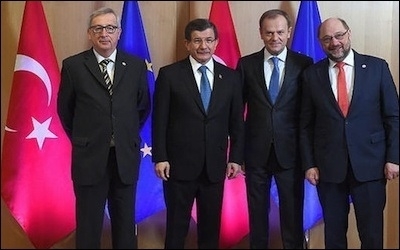 Turkish Prime Minister Ahmet Davutoglu (2nd from left) says his latest round of talks with Europe's leaders was bargaining "a la Kayseri," a Turkish city famous for its cunning merchants. Turkey has been sliding into an ugly Islamist despotism. Yet its relations with the European Union (EU) it aspires to join have rarely been better. Some call it a mutually "transactional" improvement: "pragmatism." Others, in less diplomatic language, call it Turkish blackmailing on the back of the refugee crisis. Even Turkey's Prime Minister Ahmet Davutoglu admitted that his latest round of negotiations with Europe's leaders was bargaining a la Kayseri, a Turkish city famous for its tough-bargaining merchants. In reality, modern Turkey has never been this galactically distant from the core values enshrined by the European civilization and its institutions, including even the EU. Turkey has never been so galactically distant from core European values. When Turkey's Constitutional Court ruled that the detention for 92 days of two journalists, Can Dundar and Erdem Gul, constituted a breach of their basic rights, President Recep Tayyip Erdogan did not hide his anger. He said he would not respect or obey the Supreme Court's ruling. The journalists had been charged with espionage and terrorism after their secular newspaper, Cumhuriyet, ran photos and a story about Turkish intelligence sending trucks full of arms to jihadists fighting in Syria. Prosecutors demand life sentences for the prominent journalists. The Constitutional Court has to be one of the institutions that should be the most sensitive about the interests and rights of the state and the people. But this institution and its president have not hesitated to rule against the country and its people on one of the most concrete examples of a massive attack towards Turkey in recent times. Turkey is now a country where the elected president publicly says that he will not obey a ruling from the Supreme Court. In one of its boldest moves against free speech, Turkish courts, controlled by Erdogan's government, put the newspaper Zaman, one of the last remaining media critics of Erdogan, under state control. A court actually appointed administrators to run the newspaper. Editor-in-chief Sevgi Akarcesme said that this was effectively the end of media freedom in Turkey. said in a letter to Turkish Prime Minister Davutoglu that press freedom in Turkey is "under siege." Turkey ranks 149th out of 180 countries in the 2015 Reporters Without Borders World Press Freedom Index. Unsurprisingly, Turkey ranks 149th amongst the 180 countries in the Reporters Without Borders' World Press Freedom Index 2015. It's not just the press. Prosecutors also detained four prominent businessmen who run a multibillion-dollar conglomerate for alleged ties with Fethullah Gulen, a Muslim cleric who was formerly a staunch political ally of Erdogan. Gulen's followers broke with Erdogan after the two groups entangled in a power-sharing struggle in late 2013. The newspaper Zaman too, was a Gulenist outlet critical of Erdogan's undemocratic practices. After its seizure by the judiciary, the newspaper now features a distinctly pro-government slant. One of its front pages after take-over featured a picture of a smiling Erdogan. Against such a gloomy background, the EU's ties with Turkey, instead of going into the deep freeze, are flourishing. Two ministers from German Chancellor Angela Merkel's government have voiced support for Turkey's EU membership bid in an apparent praise for Turkey's potential "usefulness" in Europe's efforts to deal with a pressing refugee crisis. "I am for the opening of the chapter on justice and human rights, finally," German Justice Minister Heiko Maas of Social Democrats (SPD) told German magazine, Spiegel, in an article published on March 11. Defense Minister Ursula von der Leyen said: "It is right to accommodate further the negotiations on Turkey's EU membership now." 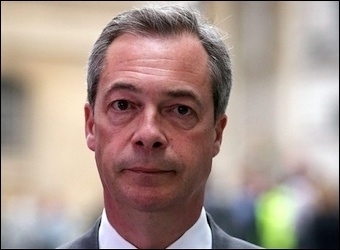 Nigel Farage, leader of the UK Independence Party (UKIP), accuses Turkey of "blackmailing" the EU. Such praise came when Turkey and the EU are in negotiations over a re-admission agreement in which Turkey will take back some of the illegal Syrian migrants who reach Greek shores –-and then travel to central Europe—in return for a visa-free travel regime for 79 million Turks and speeding up Turkey's several decades-long membership process. After the latest round of talks with the EU, Davutoglu proudly told reporters of a "Kayseri-style bargaining," not hiding his pleasure at tricking the Europeans by the notorious business cunning and acumen of the people of Kayseri. Quite realistically, Nigel Farage, a British opposition figure, accused Turkey of "blackmailing" the EU over the Syrian refugee crisis and its proposed EU membership. The UKIP party leader told the European Parliament it was "outrageous" that Turkey had been offered concessions on joining the bloc in exchange for doing a deal to accept more refugees and migrants. None of what has been going on in Turkey is surprising. By a popular vote, the country has been dragged into an Islamist tyranny. Yet it is only by a grotesque irony that the European leaders might surrender.